Carries and displays 6 wine glasses or bottles. Solid wood cheese board stores in the base. Perfect for taking the party outside or carrying bottles up from your wine room. Made from solid Oak. Can it say vineyards instead of winery? I called and asked to change winery to vineyards and they did it! Can it say Cellars in lieu of Winery? BEST ANSWER: The Personalized Wine Tasting Carrier only allows you to personalize line one which can accommodate 15 characters. 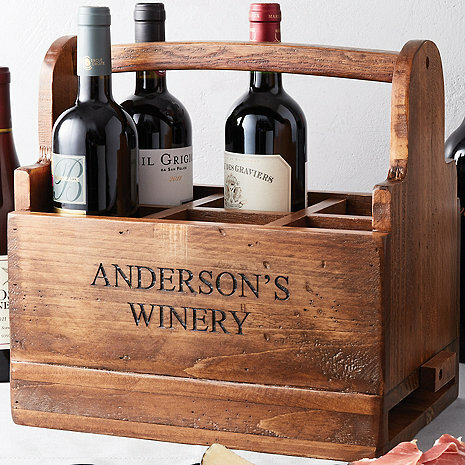 We do offer a Personalized 6 Bottle Wooden Wine Caddy where you can personalize the one line with up to 25 characters, item number 956 01 06. I preferred Winery, but I think Cellars would be acceptable as well. Is the 's customizable or is it fixed? I'd prefer to use the vineyard name (no 's). BEST ANSWER: Hello, we do offer custom personalization depending on what you were looking to have printed. Please reach out at 800-356-8466 and our sales department will be able to assist you with any custom personalization needs. Thank you! Heavy and sturdy! Love the old world feel. Clever cheese board under for a great combination. The Carrier arrived at my son's home (his Christmas gift) without the cheese board. When I found out, I notified you by e-mail, and your vendor promised to send one out ASAP. I'll let you know more about this purchase when the rest of it arrives. Thanks for your prompt response.